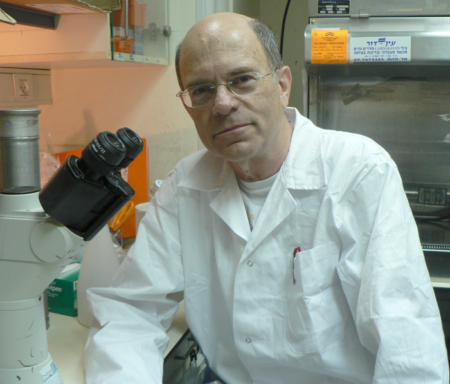 With a multi-year grant award from the A-T Children’s Project, Yossi Shiloh, PhD from Tel Aviv University in Israel will now turn much of his laboratory’s focus toward how the loss of the A-T protein causes brain cells to die in people with A-T.
Dr. Shiloh first met children with A-T when he was a graduate student studying for his PhD. He went on to dedicate his life’s work to understanding the disease and its cause. In 1995, his lab identified the mutated gene responsible for A-T and named it ATM for Ataxia-Telangiectasia Mutated. Since then, Dr. Shiloh has published more than 200 papers, often reporting landmark discoveries describing how the ATM protein functions. The A-TCP has supported Dr. Shiloh’s laboratory many times over the years, and we are doing so again as he turns much of his lab’s focus to developing model systems to study the role of ATM in the brain. The ATM protein’s best-known function is the mobilization of a vast cellular network in response to harmful double-stranded DNA breaks. The defective response to this breakage in A-T patients explains many symptoms of A-T, but the cause of the most devastating symptom – the muscle control problems caused by cells dying in the cerebellum – remains a mystery. Dr. Shiloh believes that the ATM protein plays a broader role in maintaining the stability of our genetic material than previously thought, and that the loss of this broader function is the root cause of the brain cell death in the cerebellum in A-T.
To test this idea, Dr. Shiloh’s lab will use funds from the A-TCP to create genetically engineered mice in which the A-T protein is missing only in the brain and will then deliver different DNA damaging agents directly to their cerebella. He is hoping that these experiments will clarify which types of DNA damage contribute to sick and dying brain cells in A-T and how. This work may ultimately enable the identification of drugs that could prevent brain cell death in A-T.